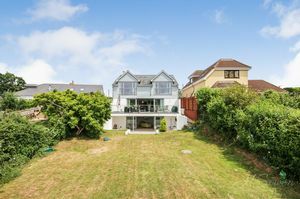 A remarkable and unique four bedroom detached contemporary house boasting expansive volumes of glass creating a truly stunning family home. 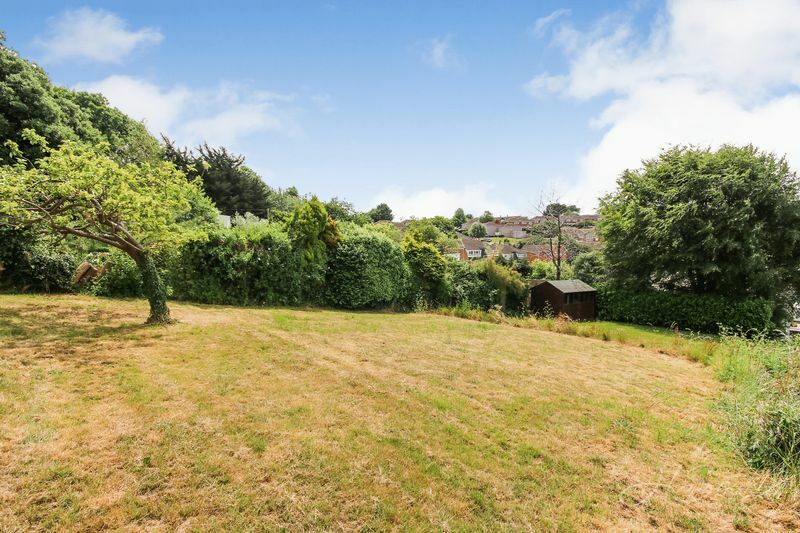 Situated in the popular area of Shiphay, the property is ideally positioned just a short walk from Torbay Hospital and the Grammar Schools as well as easy access to the A380. This one of a kind home has quality finishes throughout from the feature staircase with LED lighting to the fully fitted high spec kitchen. This property also benefits from extensive rear gardens enjoying a sunny aspect and a double garage. Upon entering the property you are greeted with the light and spacious entrance porch with stunning double doors opening into the hallway. 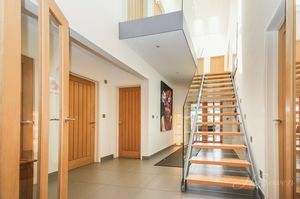 From here you have access to all principal rooms, an illuminated staircase rising to the first floor and further stairs descending to the lower ground floor. 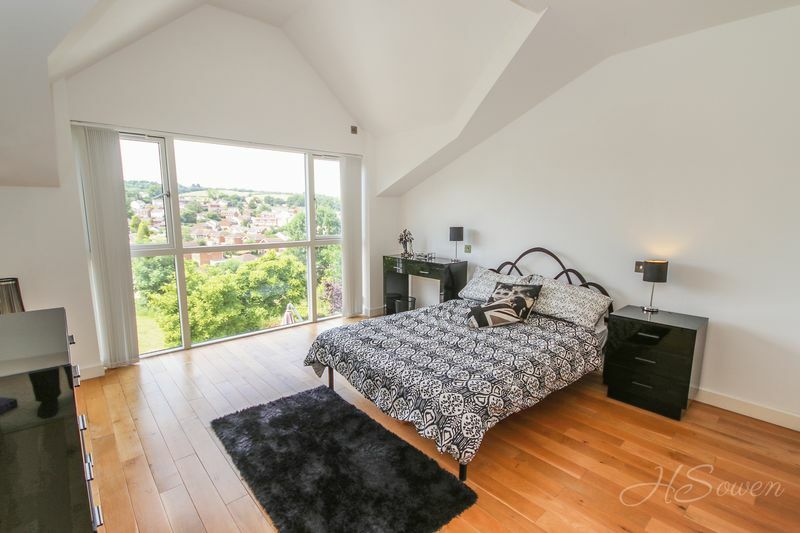 The ground and lower ground floors boast underfloor heating throughout adding a touch of luxury. 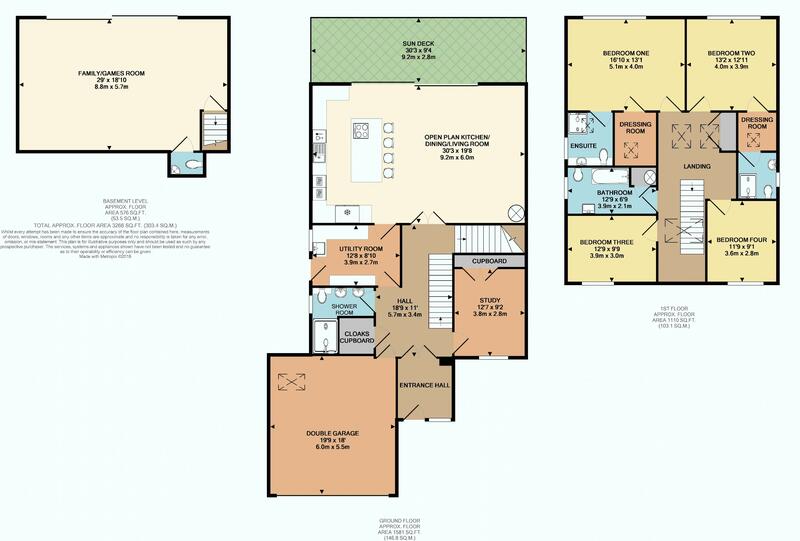 To your immediate right you will find the study/home office, offering flexible use and convenience with a double built-in cupboard providing excellent storage space. To your left you have an internal door giving direct access to the double garage equipped with power and lighting with a velux window allowing for natural light to flow through. 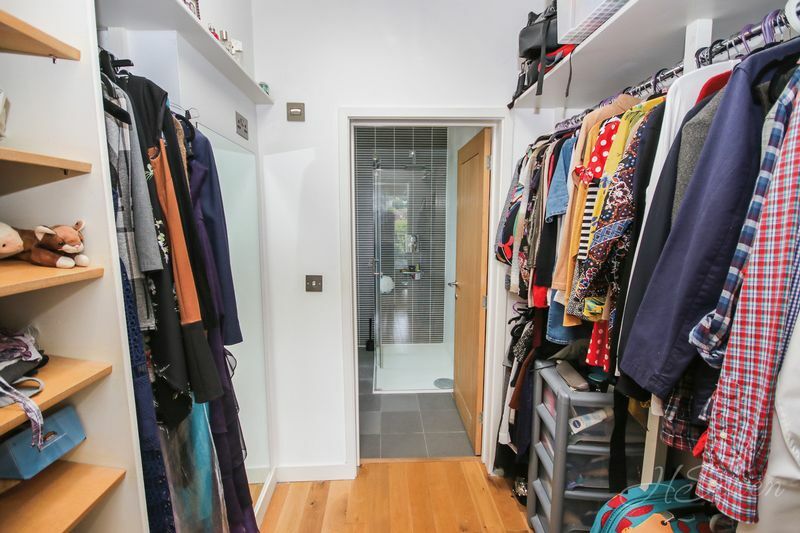 Adjacent to the garage the property benefits from a useful cloaks cupboard fitted with shelving and rails. 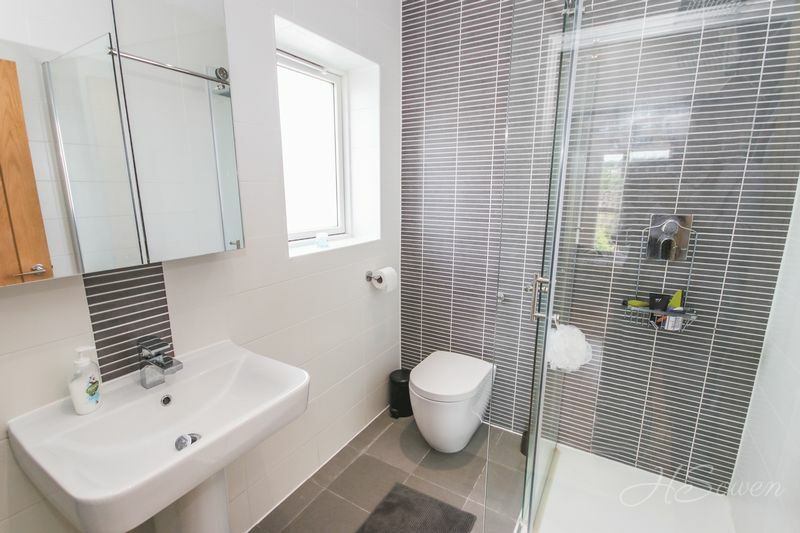 The the ground floor you also have a stunning high quality shower room comprising of Jack'n'Jill wash hand basins, a concealed cistern WC and a large walk-in mains fed rain shower finished with beautiful contemporary tiling. 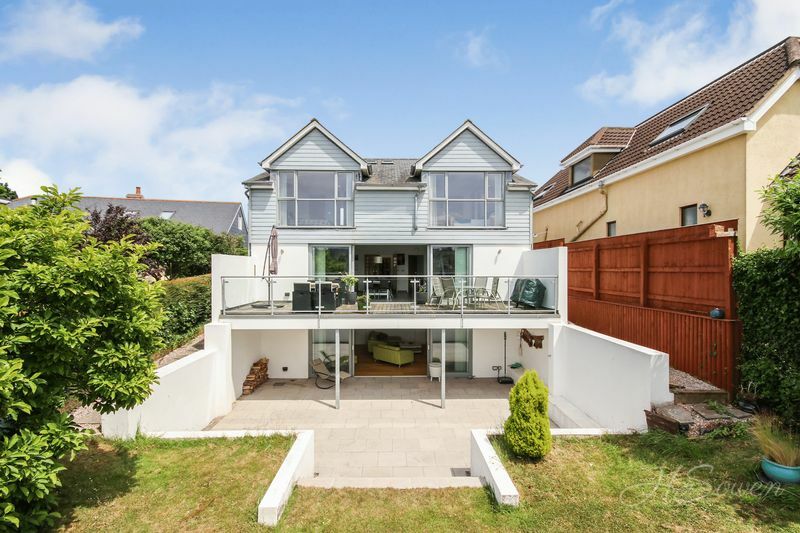 Making your way further into the property, glorious double doors with glass inserts open up into a fantastic open plan living space incorporating a stunning modern kitchen. Fitted with high white gloss fronted wall and base units complimented by contrasting granite work tops and upstands, the kitchen has been created with attention to detail and a quality finish. 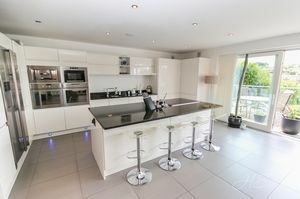 There is a matching island breakfast bar with LED lighting, a fitted 'whirlpool' four-ring induction hob, a contemporary concealed downdraft 'De Detrich' extractor unit and a gorgeous wine fridge. 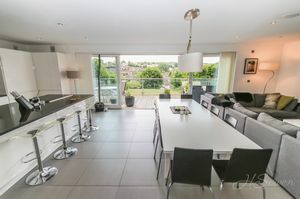 It is also fitted with a range of appliances to include 'Whirpool' eye-level double ovens, a microwave and a fitted coffee machine. 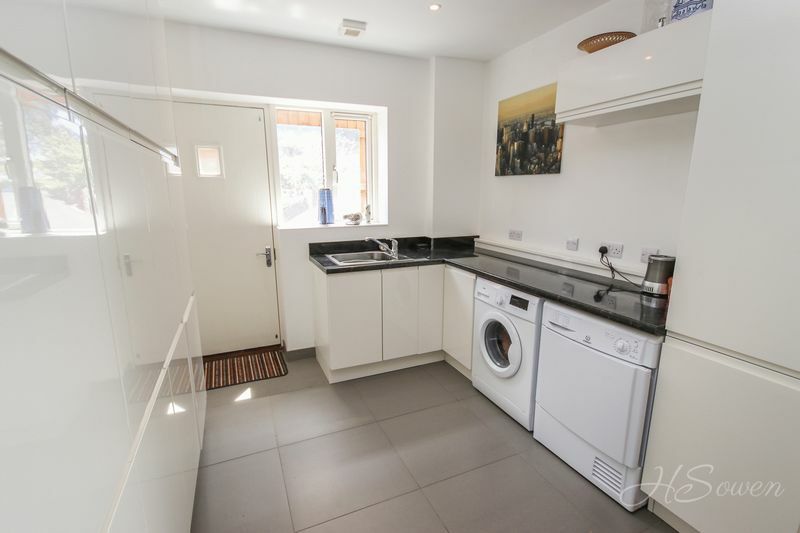 Furthermore there is also an integrated 'Hotpoint' dishwasher and a plumbed American size 'Samsung' fridge freezer with a water and ice function. 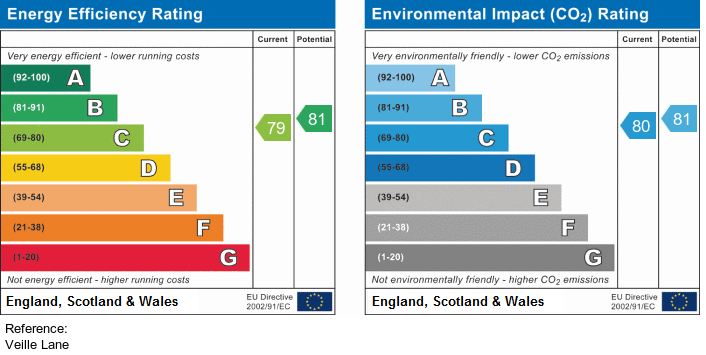 Further high quality specifications can be noted from the blue LED plinth lighting to the fitted speaker system. The fantastic open plan living space creates a true heart of the home with an abundance of space for the entire family to enjoy. 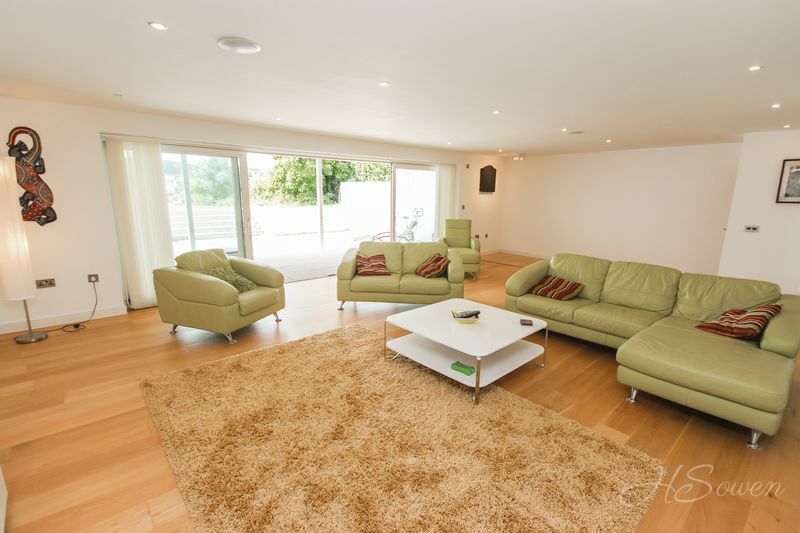 The living area boasts a wonderful wood burning stove creating a cosy atmosphere during the cooler months. 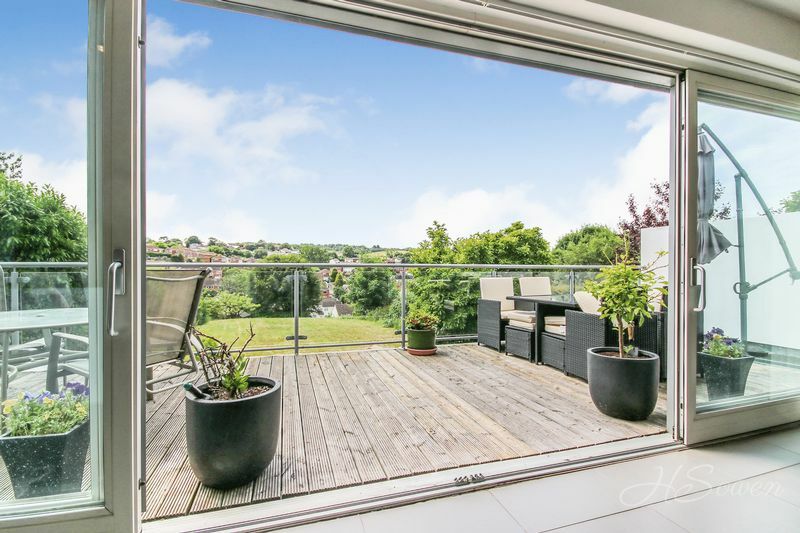 This room also benefits from superb double glazed sliding doors leading you directly out onto a decked sun terrace enclosed by glass balustrades and enjoying a fantastic sunny aspect. Adjacent to the kitchen a door gives access to a generous sized utility room, equipped with matching wall and base units and an inset sink. Aside from an abundance of storage space, this room also has space and provisions for a tumble dryer and a washing machine with a door giving access to the side elevation of the property. The staircase connecting the ground floor to the first floor is a key feature in this property, with an atrium style entrance hall it has been beautifully designed to encourage natural light to flow through. 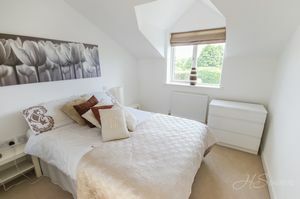 The first floor landing is light and spacious with a built-in cupboard and access to all four bedrooms and the family bathroom. 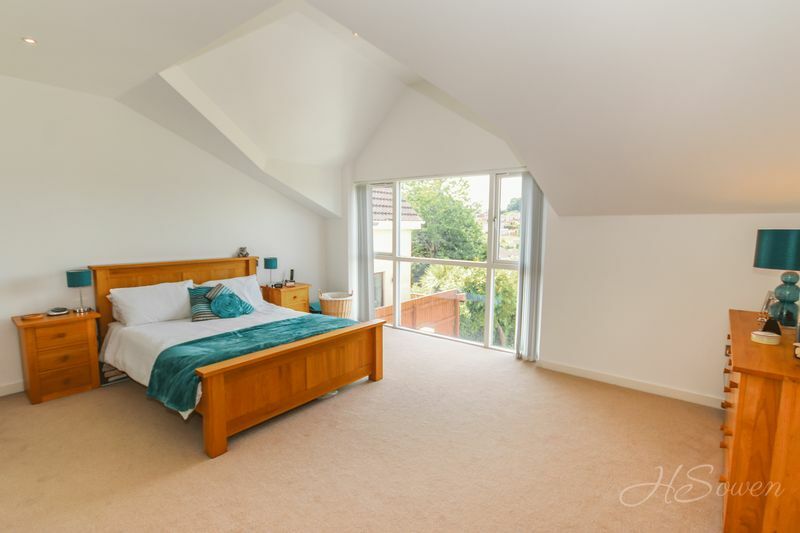 The master suite and bedroom two are both positioned to the rear elevation with glorious floor to ceiling feature windows looking out over the extensive gardens. Both rooms also boast ensuite shower rooms and dressing rooms creating a palatial living style with a range of skylights enabling natural light to flow. Bedrooms three and four are both double rooms positioned to the front elevation of the property. 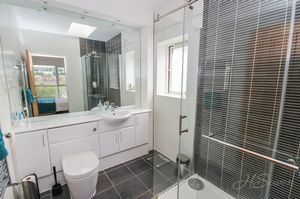 The family bathroom is finished to the same high standard as the rest of the property, comprising of a panelled bath with central taps and a shower over, a concealed cistern WC and a wash hand basin. It also has a useful airing cupboard with shelving, also housing the hot water cylinder. 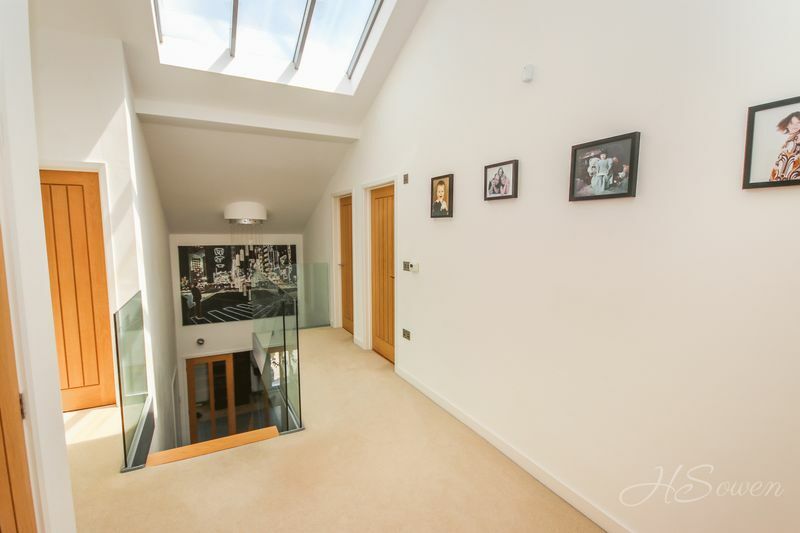 Taking the stairs from the ground floor you will descend to a fantastic and extensive family room, offering a whole host of uses it is fitted with an integrated speaker system and a cloakroom toilet. 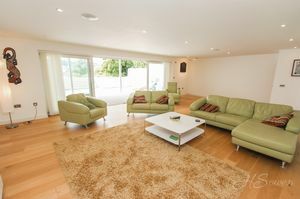 It also benefits from double glazed sliding doors opening out onto a patio with the rear gardens beyond. 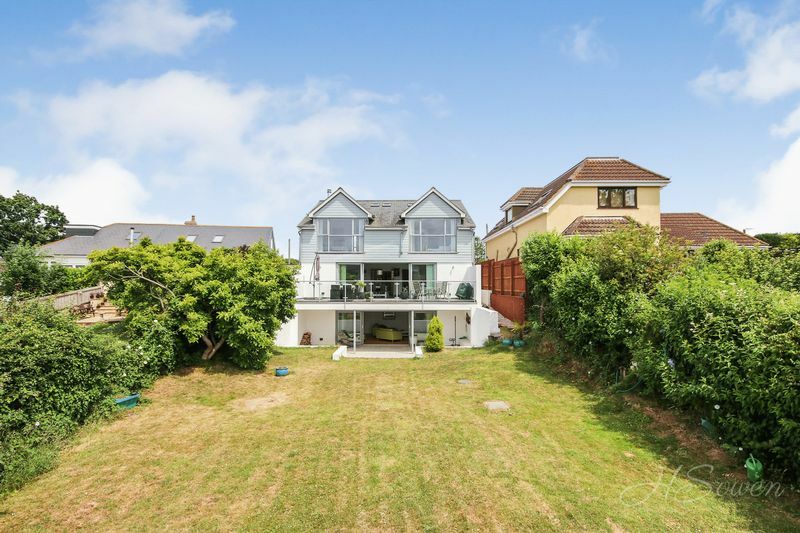 This exquisite family home occupies a fine plot situated in a private road. To the front elevation a driveway offers off road parking as well as a double garage with an electric up and over door. There is a timber gate giving side access to the rear gardens. 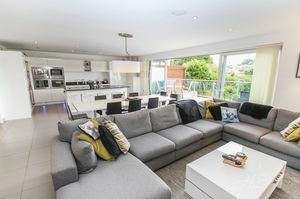 To the rear elevation, a decked sun terrace leading off from the open plan living space creates a perfect haven for relaxing or entertaining guests. 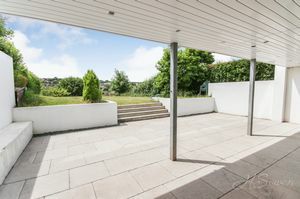 At lower ground floor level leading off from the family room is a spacious patio area in turn leading directly on to the extensive lawned rear gardens. Enclosed by mature hedging and timber fencing the garden is a substantial size and comprises of three shallow tiers leading to the bottom with a garden shed. The property is fitted with a variety of outdoor lighting to both the front and rear elevation illuminating this gorgeous property at night. 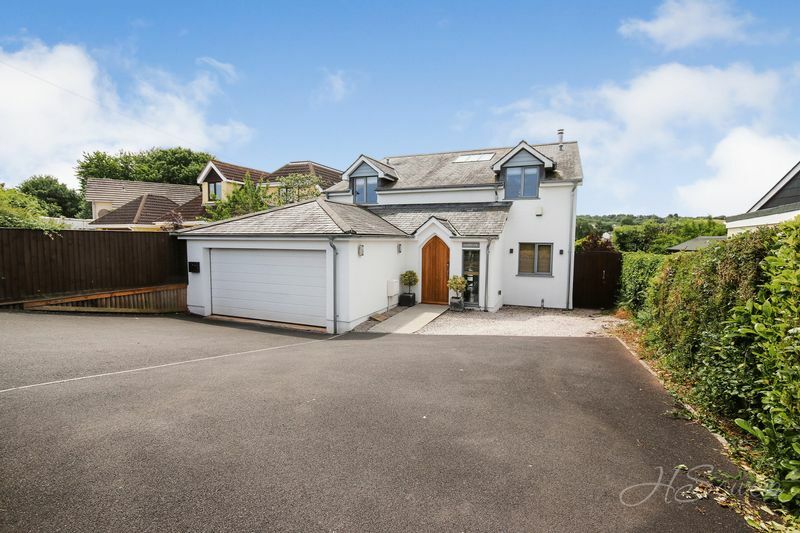 This four bedroom detached house is located in a private cul-de-sac in a sought after area of Torquay. It is close to the Grammar Schools and Torbay Hospital as well as a local bus service nearby providing flexible transport to many different destinations and Torre Train Station is just under a mile away. The local country pub 'The Devon Dumpling' is also situated close by, providing a warm atmosphere and a great social scene. 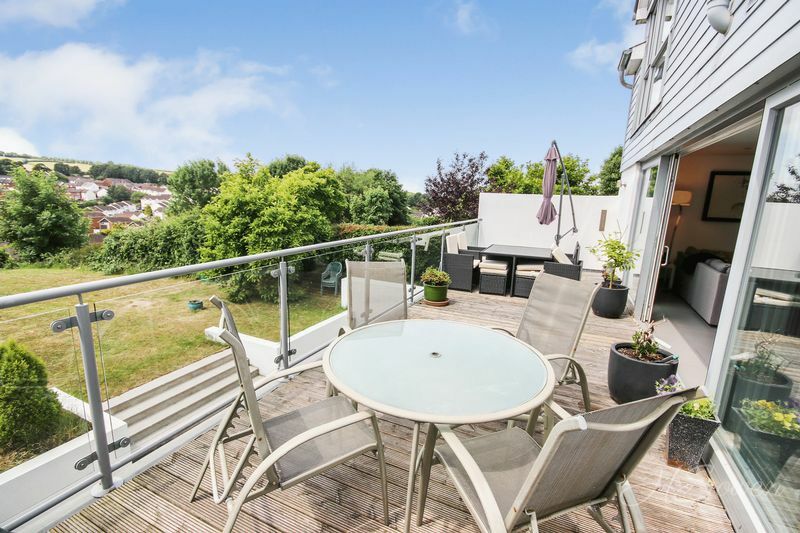 Just a short walk away is a local parade of shops and amenities including the popular Co-op, a post office, a cafe and a doctors surgery. Tiled floor. Video intercom. Double glazed window to front elevation. Underfloor heating. Double wood doors with glass inserts to hallway. Thermostat. Tiled floor. Underfloor heating. Thermostat. Spotlights. 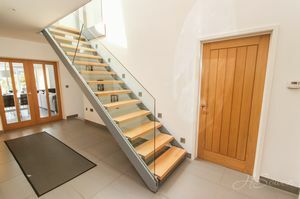 Feature staircase with glass balustrades and LED lighting to first floor landing. Stairs descending to lower ground floor. Double glazed window to front elevation. Tiled floor. Underfloor heating. Telephone point. Spotlights. Built-in inset ceiling speakers. Fitted double cupboard with shelving. Rails and shelving. Extractor fan. Tiled floor. Double glazed frosted window to side elevation. Tiled floor and walls. Underfloor heating. Concealed cistern WC. Large walk-in shower. Jack'n'Jill wash hand basins. Spotlights. Chrome ladder style heated towel rail. Extractor fan. High white gloss fronted wall and base units. Granite work tops and upstands. Matching island breakfast bar with LED lighting, integrated triple power point, fitted 'whirlpool' four-ring induction hob, concealed downdraft 'De Detrich' extractor unit and wine fridge. Inset sink and drainer unit. 'Whirpool' eye-level double ovens, microwave and fitted coffee machine. Integrated 'Hotpoint' dishwasher. Fitted plumbed american size 'Samsung' fridge freezer with water and ice function. Blue LED plinth lighting. Spotlights. Fitted speaker system. Tiled floor. Underfloor heating. Tiled floor. Underfloor heating. Double glazed sliding doors to sun deck. Contemporary wood burning stove. Television point. Spotlights. Double glazed window and door to side elevation. Tiled floor. Underfloor heating. High gloss fronted wall and base units with roll edge work tops over. Inset sink with mixer tap. Spotlights. Television point. Smoke alarm. Space for washing machine and tumble dryer. Power. Lighting. Skylight. Electric up and over door. Consumer units. 'Worcester' boiler. Built-in cupboard with shelving. Smoke alarm. Thermostat. Fitted carpet. Spotlights. Contemporary wall mounted radiator. 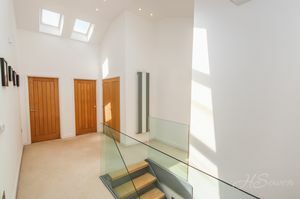 Skylights to front and rear elevation. Double glazed floor to ceiling window to rear elevation. Fitted carpet. Spotlights. Contemporary wall mounted radiator. Television point. Rails and shelving. Fitted dressing table. Skylight. Fitted carpet. Spotlights. Tiled walls and floor. Mains fed shower. Concealed cistern WC. 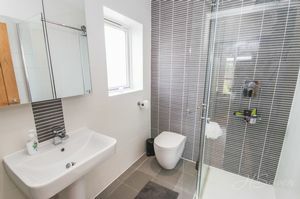 Wash hand basin within vanity unit. Frosted double glazed window to side elevation. Velux window. Spotlights. Chrome ladder style heated towel rail. Extractor fan. Double glazed floor to ceiling window to rear elevation. Wood flooring. Spotlights. Contemporary wall mounted radiator. Television point. Rails and shelving. Skylight. Spotlights. Wood flooring. Large mains fed shower. Concealed cistern WC. Pedestal wash hand basin with mirror fronted cabinet above. Double glazed frosted window to side elevation. Tiled floor and walls. Chrome ladder style heated towel rail. Double glazed window to front elevation. Fitted carpet. Spotlights. Wall mounted radiator. Television point. Panelled bath with central taps and shower over. Glass shower screen. Concealed cistern WC. Wash hand basin. Tiled floor. Part-tiled walls. 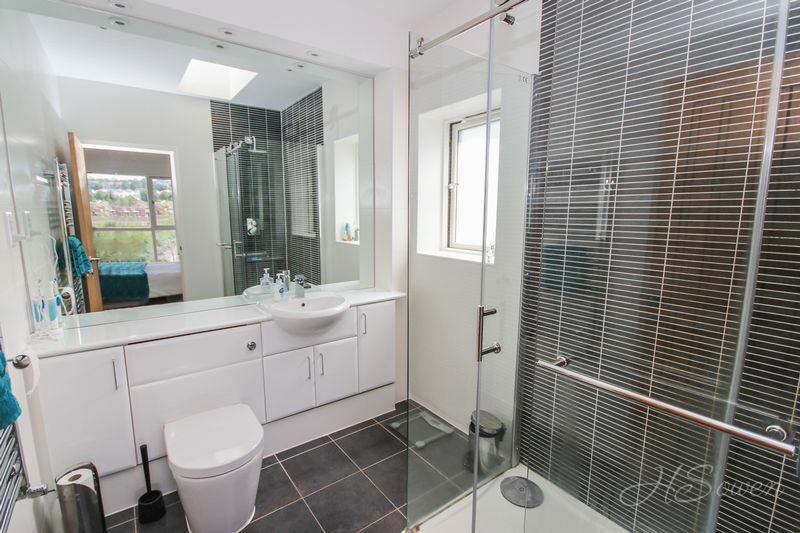 Built-in airing cupboard with hot water cylinder. Chrome ladder style heated towel rail. Frosted double glazed window to side elevation. Vanity mirror. Wood floor. Double glazed sliding doors to rear garden. Television point. Underfloor heating. Spotlights. Speaker system. Low level WC. Corner wash hand basin. Tiled floor. Extractor fan. Spotlights. Driveway to front elevation. Gravelled area. Outside downlighting. Power points. Timber gate to side elevation. Rear garden laid mainly to lawn. Patio seating area from family room. 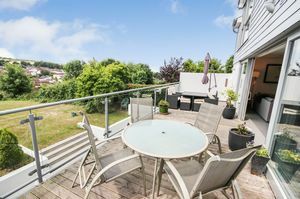 Decked sun terrace with glass balustrades from open plan living space. Timber shed. Enclosed by mature hedging and trees. Outside water tap.